Strictly speaking we don't entertain at the Beach House in Winter. But I guess rules are made to be broken and as I have been getting my cooking mojo back lately, the "Winter Rule" has been regularly broken of late. But these days it has to be oh so simple. 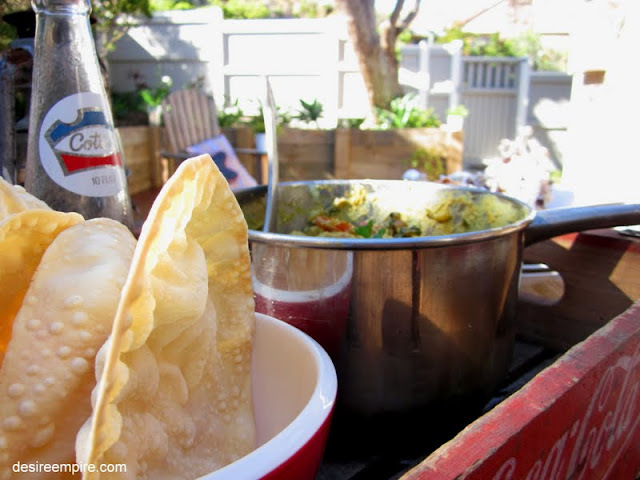 I have done a myriad of cooking courses over my life and am descended from a family who loves to entertain. It was nothing for me to put together a five course French inspired lunch, or a drinks party for 75 back in the days when....... but since the arrival of rug rats and having to come up with two interesting and edible meals most nights of the week, the gloss of cooking has worn off somewhat. Although I must say it comes in ebbs and flows. And at the moment, lets jut say I am in somewhat of a purple patch. The Beach House Brats could represent Australia in the 'making mess' events, and I'm sure they would bring home gold as well, so most of the day before our dinner guests show, is spent cleaning up the Beach House. So last weekend, to make things easy, I decided I would do all the cooking the day before so as to reduce the pressure completely. Hence the day time photo shot, for anyone that noticed. When I say 'all the cooking' I am only referring to a chicken yogurt curry and an orange cake, but these days that's enough for me. As long as it tastes great and is simple, these are the two mantras I live by in the entertaining world and they work for me. Have I mentioned my 6 ingredients rule? I love recipe's with 6 ingredients give or take. If the recipe calls for you to throw it into the food processor or pot all together, then even better. Well that's pretty much the case with what I'm calling 'Annettes' Best Ever Orange Cake'. Apart from boiling and then reducing to a simmer, two navel oranges for an hour, that's pretty much all you have to do. This cake was a hit, even with my completely recalcitrant kiddos who eat very little and are uber selective when they do. 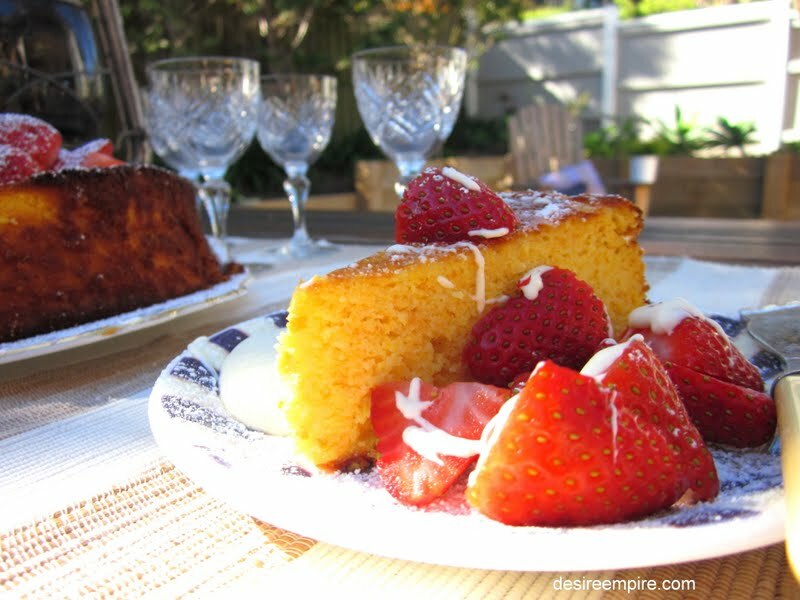 So here's the recipe for the easiest yummiest cake, lifted straight from Annette's email, that got lost in cyber space for a month or so. Heat oven to 180 C / 350F grease cake pan. Place whole oranges in a saucepan, cover with cold water and bring to boil on high. Reduce heat to low and simmer for one hour until tender. Top up water if necessary. Drain oranges cut in half and discard pips. Place in food processor and blend until smooth. Add all other ingredients and process again. Pour mixture in prepared pan bake for 45 minutes to one hour until cooked when tested. Cool in pan for five minutes before transferring to a wire rack dust with icing sugar serve with cream. I also put the strawberries on top as you can see here. Once the shoot was over. I gave the strawberries and the portion of cake I had cut to the kiddos. The icing sugar just melted into the cake as it was so moist. I wrapped it in foil, left it on the kitchen bench over night and started all over again with the decorations when I was serving it up for real to the dinner guests. And now for the chicken curry. This recipe was in a bundle of recipes I received as part of the fee, when I did the best ever Asian cooking course over twenty years ago. I used to put this great Asian dinner party together when I was single, this chicken curry being one of the dishes. Maybe you did this kind of thing as well in your single days. The dinner party went something like this. Each girlfriend I invited had to bring a guy they weren't interested in. It was a great way to meet eligible men. I have to tell you several of my friends met their future husbands at one of my famous singles dinner parties eating this very curry, so watch out as it is rather special. Although 15 or so years on, I haven't done any research as to whether those girls are really thanking me now. Ah ignorance is bliss!!!! One of the couples that met at one of my dinner parties, repaid the compliment and I met Mr Beach House through them. It was all a set up and he had no idea, until much later....but truly that's another story in itself. Toss in tomato, stir yogurt through and cover, simmer on a low heat until you are ready to serve. The recipe I have given you feeds 2-3 hearty eaters. I doubled this recipe for our dinner, but I felt the need to make two batches at the same time. This meant two saucepans but that's what dishwashers are for right? 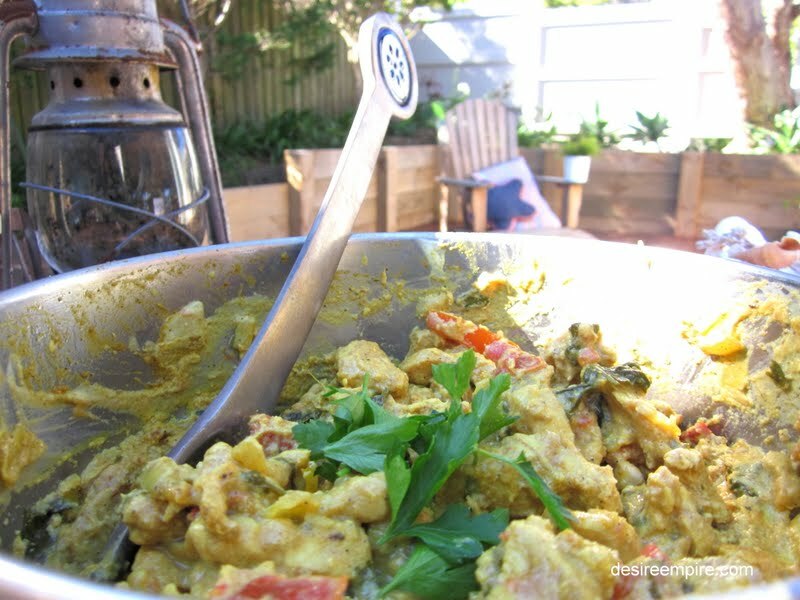 This curry, like all curries, is best prepared the day before to allow the flavours to meld together. That's not to say I haven't raced home and thrown it together in 25 minutes and eaten it there and then though!!!! 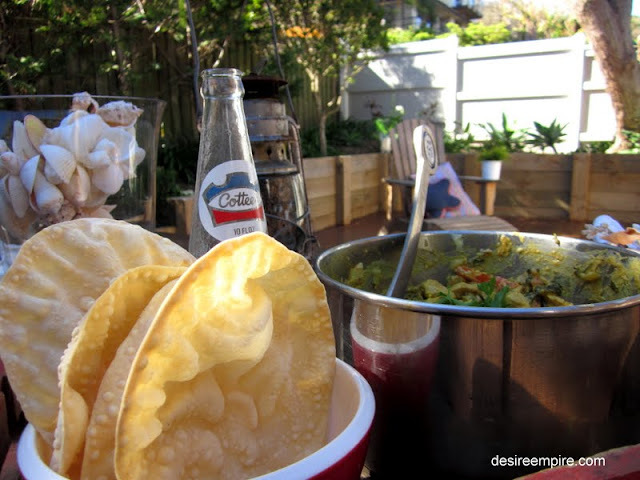 I serve it with store bought poppadoms and banana mixed with desiccated coconut. It has always been very popular, whether it's a day old or not and has even been present at the beginning of several long and meaningful relationships, so who knows dear reader, where this one will take you, if you are looking for love. it all sounds very yummy! you're making me hungry. The cake is a scene stealer here. But I'm more likely to make the Chicken Yogurt Curry. I have 26 years in of trying to think of dishes to prepare for dinner. That cake smoothed in strawberries would be heavenly having a big slice. I'm going to try that orange cake recipe, because I also live by the six ingredient rule! Nothing like a good picnic to take the edge off a hot summer's day! It’s puce and chartreuse that I hate. Of clothing that looks just first-rate. Oh that looks good! I will have to try that! Thank you for sharing. It all looks delish! I am going to try the cake recipe. Happy Rednesday! Sometimes SIMPLE is best! I like that you used to do the "fancy" entertaining and don't feel bad to now do the "easy" get-togethers. I think that's great! Your food items look and sound super delish! I've never heard of the "match-maker" type parties you mentioned - sounds much better than the "bar scene"! Oh yum, your posts on food are always so mouthwatering, it makes me want to get dinner underway asap. Looks like a lovely meal and beautiful setting. 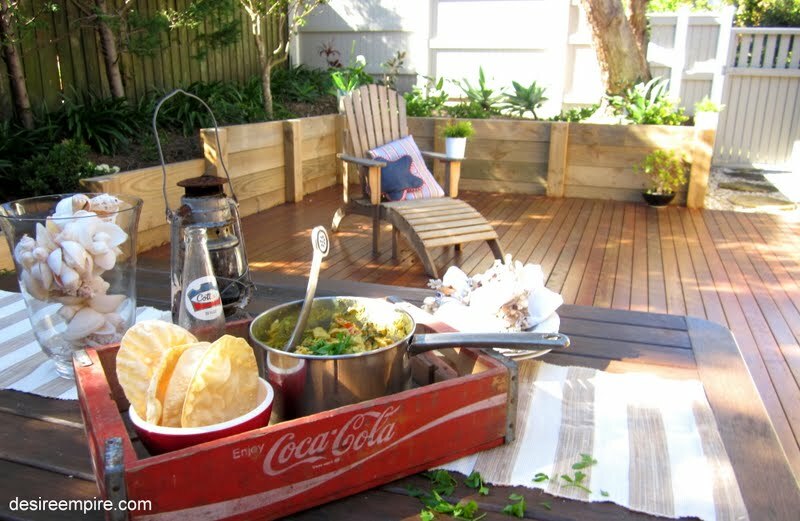 It makes me even more anxious to get our renovation done and start to enjoy some real alfresco dining. I just discovered your lovely blog and have signed up as a follower. I've just put the finished touches on my new blog ‘Coastal Style’ It will have lots of inspiration on beach houses, resortwear, summer food, travel and anything ‘beachy’. I had a lot of fun putting it together so maybe you would like to check it out if you have a spare minute. Oh my goodness!!! Everything is set up so beautifully and it looks so, so very delicious!! Now I'm hungry!! This cake looks divine!!! I absolutely pefer to cook the day before! Very very yummy, please give me plate I will join. I'm with you! The simpler, the better. I love coming up with ideas to have things all ready for the day of the party. I want to enjoy myself too! That cake looks divine! Such a lovely outdoor setting! The serenity of it all certainly must help out on hectic days. I love the party you described where each girlfriend brought a guy. I will suggest that to my stepdaughter. She and her friends are always looking for new ways to meet interesting men who have already been "checked out" in advance. Seems like a safe, fun way to do it! Lovely post! Yum... definitely should not read this post just before dinner! Thanks for linking to Share the Love Wednesday. Hope you'll be back this week! you'll be seeing me on your site often, looking forward to reading your blogs. I needed this last January! The recipes and pictures both look fantastic...thanks for sharing! That is such a gorgeous cake! :) What a nice way to enjoy the great out door too. Just found your blog today! 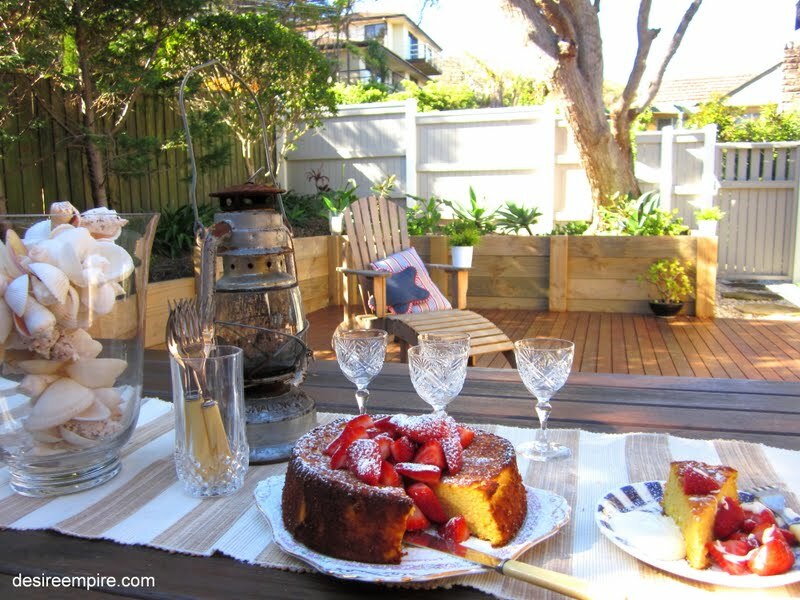 I a doing a bit of exploring and fell in love with your deck, entertaining decor and the orange cake!!!! I live in North Vancouver, BC, Canada! 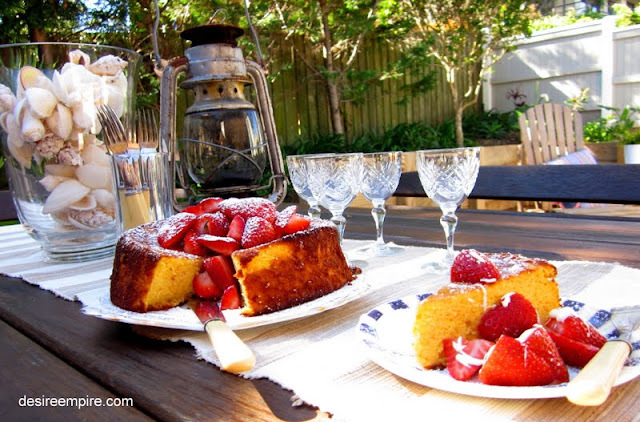 For sure I will make your cake next backyard party we have! Hi, Carolyn!!!! 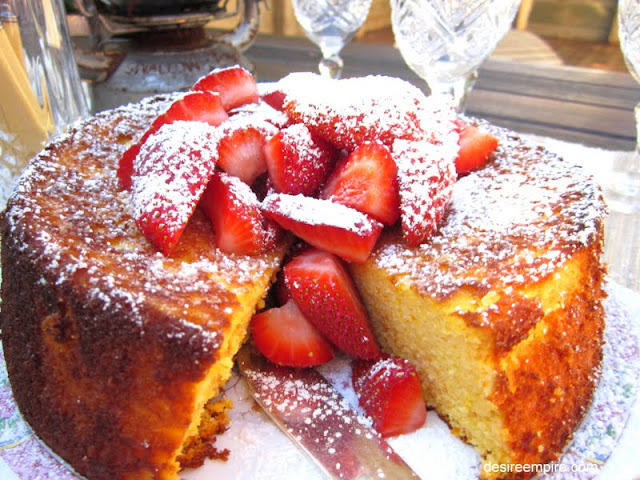 AS I told you, I could NOT WAIT to make your Orange Cake!!! I made it yesterday!!! YUMMY!!! Mine did not look as gorgeous as your, LOL!!! Now looking at your picture again it seems your was more "cooked" than mine??? I wish I could add a picture here to show you!!! Thank you so much, I can't wait to try more of your recipes! And I love the way you set up your photos... I am learning with you! Love your site. Am sharing it with granddaughter in NYC.I find the light blue typing very challenging on my eyes,so probably will not be able to visit often, but thanks for your lovely ways. I made the orange cake today. Very tasty!